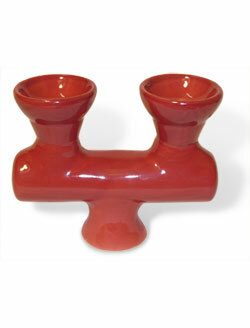 Double Head Ceramic Hookah Bowls function just like the Traditional Clay Bowl except there are two bowls attached to each other through a common area connector. Benefits of using this style Hookah Bowl include dedicating each bowl to its own specific flavor for ease of refilling each bowl as well as mixing flavors in each bowl to enhance your overall smoking experience. Double Head Bowls are very durable and are made to work with most style Hookah models in the industry and come in a variety of colors. Each of the two bowls can hold up to approximately 10 grams of Flavored Tobacco with a total of 20 grams within the whole piece.